At the bottom of the Catacombs of Carthus is the Smouldering Lake. This area is home to the massive Carthus Sandworm, and to the Old Demon King. Lost Izalith can be accessed from this area through a secret ground entrance at the base of one of the massive archtrees. 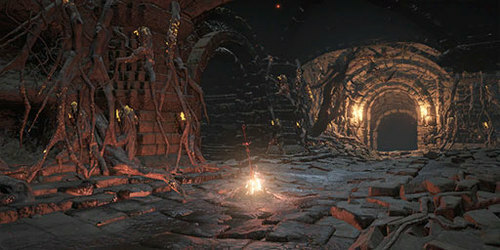 If you spoke to Anri of Astora in the Catacombs of Carthus at both of her locations (once near the entrance and the long staircase, and again overlooking the bridge before the High Lord Wolnir boss room), you will find Horace in a hollowed and hostile state inside of a small cove near the entrance to this area. To find him, enter Smouldering Lake and turn right, then search for a small cave opening along the wall. Smouldering Lake is Ash Lake in the far future . Geographically, Smouldering Lake is in a similar position as Ash Lake was in Dark Souls I - it is near Lost Izalith and the Tomb of the Giants at around the same elevation. Additionally, the archtrees in Smouldering Lake are very similar to those found in Ash Lake.